Don’t want your necklaces to get lost or irreparably tangled up? Don’t want to have to deal with putting every individual piece of jewelry in it’s own ziploc bag – a practice that is both time consuming and wasteful? That’s where ice cube trays come in. The individual partitions are the perfect size for rings, earrings, and necklaces; and they can be stacked in a box and put away without trouble. The best part: this DIY project requires no work aside from buying some ice cube trays! This DIY PVC Bin Storage Organizer project can be useful for organizing bins in your basement, garage, or storage unit. It’s great because while it involves a bit of building, it’s not inaccessible to those of us that have never done a DIY project before. All you’ll need are a few different pieces of PVC pipe, including X and T shapes as well as more traditional straight pieces. Click through the link to get an exact diagram of how to put the pieces together to create a simple, useful storage shelf. Hanging a pegboard on the wall and adding a few hooks, buckets, or similar hardware can lead to an especially useful and dynamic storage device. You can use pegboard to hang pots and pans in the kitchen, tools in the garage, or smaller items you don’t want to lose in the depths of your storage unit. This DIY project can either be super easy or more involved depending on how you want to go about it. The end goal is to have labels for your home storage bins that are organized and easy to read so that when you’re looking for something, it’s easy to find. There are some websites with free printable labels out there, but if you want to make them yourself we recommend making labels that are at least 5 x 5 inches and lined for easy labeling. Color coding your labels by using permanent markers in a variety of colors is a great way to make things easier to organize as well. All of these projects evoke the same mindset: the ability to creatively re-use things you already have lying around. 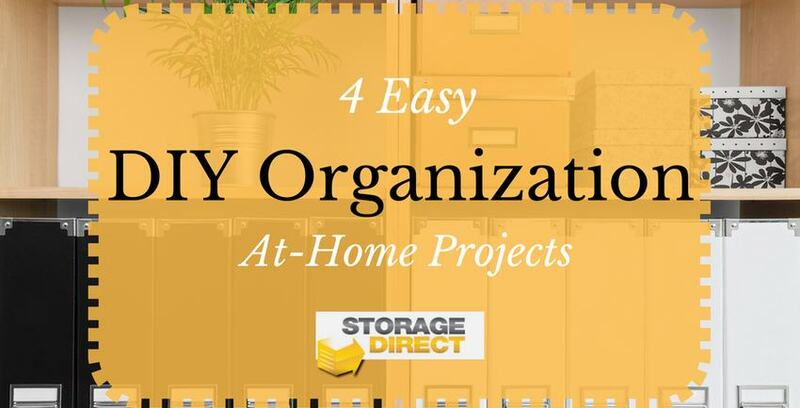 That’s the cornerstone of quality organization, and we hope these projects can help you reevaluate the way you look at your home storage. Do you have any suggestions to add to the list? We’d love to see what DIY ideas you have to share in the comments below!